Since the creation of Bitcoin in 2009, the use of cryptocurrencies has come a long way. Now, an increasing number of people look at different cryptocurrencies as sources of investment. However, might investing in cryptocurrencies work well for you? There is no clear answer to this, and it requires that you pay attention to the pros and cons as well as your individual circumstances. Bitcoin is one of many cryptocurrencies that rely on blockchain technology. Some of the other more popular ones include Ethereum, Litecoin, Ripple, Zcash, and Dash. Blockchain, the underlying technology, is finding support from different quarters ranging from governments, to financial institutions, to the healthcare industry. Several top businesses have put using cryptocurrencies through a testing phase, some of which include UBS, American Express, Western Union, and MoneyGram. Several countries such as the U.S., Canada, Russia, China, and Australia and have taken measures to come up with suitable regulations surrounding the use of cryptocurrencies. The reduced uncertainty has boosted trade activity to some degree. Stricter regulations will also help minimize crypto scams, given that new entrants will have to adhere to stringent guidelines. The flip side is that this might have a negative impact on the anonymity that many people expect. In addition, any major regulatory changes might also lead to high volatility in the value of cryptocurrencies. Buying bitcoin or any other cryptocurrency has simplified significantly over the last few years, mainly because of the arrival of some dependable exchange platforms. Some of these platforms let you trade in different cryptocurrencies such as Bitcoin, Bitcoin Cash, Ethereum, and Ripple. You may also use them to hold your funds in crypto-based digital wallets. Several experts opine that the best time to make the most of bitcoin has passed. If you are looking at reaping big returns, it might be worth your while to expand your horizon and take a look at other cryptocurrencies. What you have to bear in mind, though, is that your exposure to risk will remain fairly high no matter which path you take. Investors usually look at different fundamental metrics before assigning value to any asset. For example, if you wish to invest in stocks you have income statements, balance sheets, earnings, and other relevant data at your disposal. With cryptocurrencies, investors do not have access to any of the traditional fundamental metrics. This leaves your investment largely up to chance. The significant fall in the value of bitcoin that started in December 2017 shows that there is no telling when an upward trend might reverse. There have been attacks on cryptocurrency exchanges in the past, and if your cryptocurrency disappears, you might have little recourse. Fortunately, you can secure your crypto investments by using cold wallets, examples of which include printouts and USB drives. Investing in cryptocurrencies remains a double-edged sword and it is best that you only invest the money you don’t mind losing. Success in this ream, after all, is hardly a guarantee, or just about everyone would have jumped on the bandwagon by now. If you do decide to invest in cryptocurrencies, make it a part of a wider portfolio that exposes you to varied degrees of risks and returns. 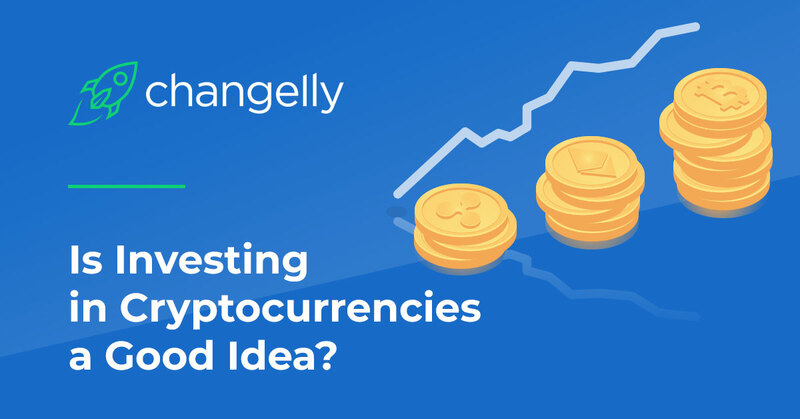 This post is written especially for Changelly blog by our guest author Jon Dela Cruz. Author Bio: Jon works with iCompareFX, an online portal that lets people compare leading overseas money transfer companies from different regions. Outside of work, he likes discovering new and old music from across genres.